This postcard from the 1920s shows Osaka’s Kitahama and Nakanoshima, an island sandwiched between the Dojima and Tosabori Rivers. Nakanoshima has already been thoroughly modernized. The red-colored stately building with the orange roof is the Osaka Central Public Hall (中央公会堂). Behind it is the Prefectural Library and behind that Osaka City Hall. Osaka Central Public Hall was designed by Shinichiro Okada (岡田 信一郎, 1883-1932) and opened in 1918 (Taisho 7). The construction was made possible by the financial contribution of 1 million yen by speculator and businessman Einosuke Iwamoto (岩本 栄之助, 1877-1916). Unfortunately, Iwamoto lost his fortune in the market and committed suicide before the building was finished. He was only 39 years old. Osaka Prefectural Nakanoshima Library (大阪府立中之島図書館) was designed by Magoichi Noguchi (野口孫市, 1869-1915) and Yutaka Hidaka (日高胖, 1875-1952) and constructed in 1904. 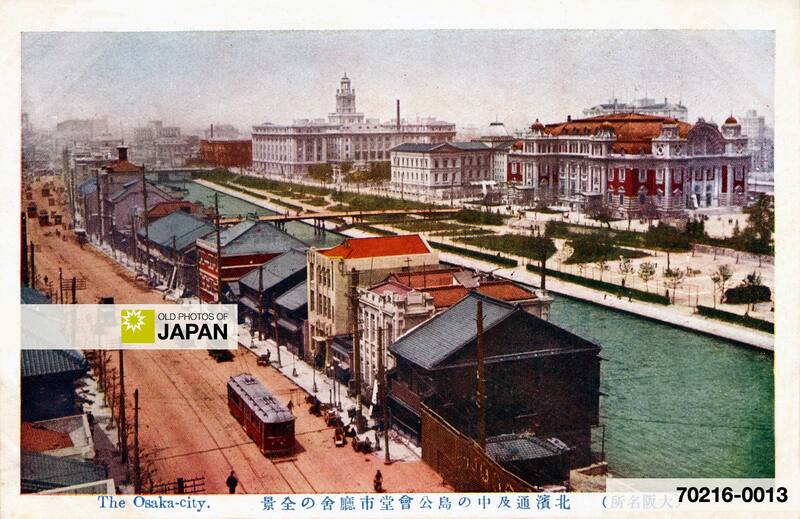 Osaka City Hall was built between 1918 (Taisho 7) and 1921 (Taisho 10). It was designed by representative Meiji Era architects like Yasushi Kataoka, Hikotaro Imabayashi and others, who followed an original design by Yokichi Ogawa. Starting in 1982 (Showa 57) it was gradually torn down and in 1986 (Showa 61) it was replaced by a modern building. Osaka Central Public Hall and Osaka Prefectural Nakanoshima Library still stand. These three buildings and the nearby court effectively made Nakanoshima Osaka’s new city center. Until then, the city and prefectural government had been located on the island of Enokojima, on the far-western end of Nakanoshima and closer to Osaka’s old harbor. For other photos of Nakanoshima, click here. You can also licence this image online: 70216-0013 @ MeijiShowa.com.